Whenever a creature dealt damage by Vampiric Dragon this turn is put into a graveyard, put a +1/+1 counter on Vampiric Dragon. 1R: Vampiric Dragon deals 1 damage to target creature. Watson As much as I like big fatties, I have to give the Vampiric Dragon a 2. The main reason is that he is costed one mana too high in my opinion. If he is any cheaper, he becomes playable as it won't be so difficult to cast him. Right now, the only decent decks that play it are reanimator decks that are playing every trick in the book to get him into play from the graveyard. His size is great and his abilities are great. I just don't see him making his way into many tournament decks right now. In casual games when you have all day to cast him, he might get a little more use. 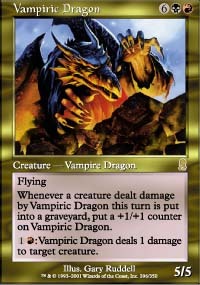 Vampiric Dragon is best in a Sealed deck, where it rates a 5. In Draft, its most likely a 4 because decks are much more focused. Due to the casting cost, its only a 2 in Constructed. I think even at 7 mana it would still be too much. Sealed allows for slower games usually, and you can almost guarantee that you'll be at 8 mana sometime in the game. A gold card with a converted casting cost of 8 is NOT gonna see much constructed play. This is an excellent option for someone wanting to "reanimate" fatties from the graveyard, but that's about it. If resolves, can be a BOMB in sealed events. Vampiric Dragon - the first thing that pops into my mind when I think of this card is, "Wow, I'd love to bust that in my Sealed Booster." Unfortunately, that's about where I stop thinking fondly on him. In older constructed, forget about it. His 7CC is almost impossible for a creature that can be easily killed. There's nothing worse than casting a Vampiric Dragon, and watch him get Swords to Plowshared, or even worse, a simple Hydroblast. When common 1CC things take down your fattie, then you need a new fattie. In newer constructed, it's a little better, but still not that great. It dodges all the black removal and would almost always take a pair, if not three burn spells to take down. It can still have it's services Terminated, though, which, like Hydroblast and StP, stinks. In a Red/Black control deck, he might have a place. 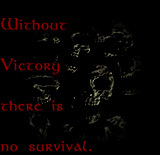 If you can hold off an opponent's horde early to get to the late game and drop him, then his ability can hold off most the rest of the horde, while still getting bigger. Black/Red Control isn't THAT big these days, though, so should not see a lot there. In limited, it's awesome, plain and simple. A first pick every time, and a potential reason to change colors if you get it late in a draft. Almost definately switch on pack two, and seriously consider a way to splash him on pack three. In conclusion, he's great trade bait, but I don't see him getting a lot of play in real tournaments. Bust him in draft, then trade him to a kid after you win the draft. The 8 mana (and requirement of 2 colors) is darn steep and almost makes me want to drop this card down to a rating of 3. Still a 5/5 flyer, in colors that lack flyers, is pretty nice. The real point boost for this bad boy comes from the internal synergy. In general I feel the Vampiric mechanic is overrated but the fact that this beast can deal direct damage means it will come into play a lot more. He's almost an expensive Masticore and you can't overlook the power. He fails in aggressive decks (because of cost) but can be the kill card in many defensive/control B/R builds. At first glance, the card looks better than Masticore: It flies, and Masticore didn’t, It shoots creatures like Masticore, it’s larger than Masticore, and it has the Sengir ability. As usual, there’s a catch. At 6BR to play, the odds of it EVER hitting the board are minimal at best in constructed. Along with this, it’s ONLY a 5/5. the 8 for a 5/5 flying is a rip off for anything. Plus, his ability to shoot requires a red, which means you can’t throw gobs of mana into him to kill a creature. You’re limited to how ever much red mana you have. Now, I may seem like I’m complaining over nothing, but there is a lot of fact in what I say. All these drawbacks will keep this card off of the Pro Tour Circuit, and as little more than great trade fodder. That’s why I give this card a 2. It’s simply not worth the mana. It's big. It's costly. It's rare. Most importantly, I don't have one. All this leads me to give it a 3. As long as the Invasion Dragons are still in standard, I think they will be the wyrms to go with.